Scenario #1. Final results with Week 10 projections in parenthesis. I guess I would call this my "best guess" as to how the games may go. 4. Orrville (beats 7-2 Wooster) - 20.30..loses tiebreaker with Genoa based on fewer 1st level points. In the above example, Orrville finished tied with Genoa...this was assuming Northwest loses to Alliance. If they beat Alliance, it will give Orrville 20.80 points and the #3 spot. So in that projection, Orrville would play Ottawa-Glandorf unless Northwest beat Alliance, then Orrville would finish 3rd and host Triway in round 1, and Ottawa-Glandorf would face Genoa. Scenario #2. Final results with Week 10 projections in parenthesis. So this scenario has both Ottawa-Glandorf and Orrville losing. If O-G were to win and Orrville lose...O-G would jump to 4th with 18.00 points, and Orrville 5th with 15.90 points, meaning Orrville would travel to Ottawa for a first round matchup. 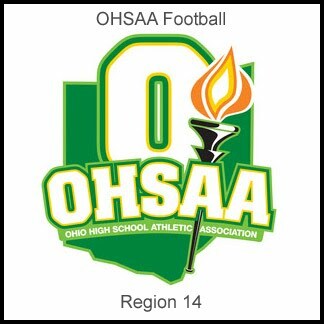 If Orrville were to win and O-G lose, O-G would finish 7th in the region and travel to Elyria Catholic while Orrville would finish 3rd and host Triway. Another interesting scenario....if both Milan Edison and Huron win their week 10 games, they could end up tied for 7th, meaning a tiebreaker would take place for which team finishes 7th and which finishes 8th. My best guess says that no matter where the chips fall, Orrville will either be hosting Triway or Ottawa-Glandorf or traveling to Ottawa. If we beat Wooster, we finish 3rd or 4th and host Triway or Ottawa-Glandorf. We lose to Wooster and either host Triway or travel to Ottawa-Glandorf. As always, it depends on how the games play out, but the possibilities are getting smaller and smaller. Looks like Titans in one form or another for the Red Riders. Hopefully a scout team is being dispatched to Ottawa-Glandorf right now to watch their week 10 matchup with Celina. If anyone sees it differently....let me know. Check your second level points for Genoa. They have 124 after 9 weeks. When they beat Elmwood, they will pick up an additional 20 points. I see Oak Harbor, Woodmore, USV, Eastwood and Lake all winning week 10, adding another 19.5 points. 124+20+19.5=163.5 second level points. Genoa will be in 3rd place with 21.15. The only way we don't play Ottawa is if they lose to Celina. Then we get Triway. ps, Genoa will have 43 first level points. I think maybe in your calculations you forgot to give them 1st level points for weeks 9-10.
if you look at USV's schedule on joeeitel.com...it says their week 10 game against St Wendelin was canceled and their week 10 replacement game against ridgemont will not count...therefore will not provide Genoa any 2nd level points. I had Genoa with all 43 1st level points....and yes they'll get 20 from beating Elmwood for 144 2nd level points. But without USV's game counting, it will only give them 16 additional 2nd level points...or 160 total. In my initial calculation, i misfigured their 2nd level points as 35 instead of 36...that 1 point gave me the 20.2 average instead of 20.3. That would mean they'd tie with Orrville but would be 3rd because of more 1st level points. Orrville needs to hope that Northwest beats Alliance for that additional 5 2nd level points. Sorry, should have checked my math. Genoa should wind up with 20.46 points. This is because Upper Scioto Valley's week 10 game has been cancelled, so the 2nd level divisor is now 99. This brings them closer to Orrville's 20.3. So... if Northwest upsets Alliance, the Riders could host Triway. Good stuff....that helps Genoa. Assuming a USV win, I have Genoa finishing with 20.65 points. Orrville needs a few breaks to go their way...and a win over Wooster to overtake 3rd now. They can still finish with 20.70 points, but the need Triway to beat Timken (likely) and Northwest to beat Alliance (tossup). Lexington could beat Ashland and West Holmes could beat clear fork...but i wont be counting on that in the least. way to go Northwest. Now Riders win and they host The Purple Titans. If not, it is a long bus ride to the Blue Titans.